The first picture is the species. The second picture is fruticosa ‘Greek Skies’ but it may not actually be fruticosa which is what it is generally known as in Australia. The leaves are much more officinalis looking. This is pronounced as fruit .. but doesn’t have an ‘i’ in the spelling. Sometimes it is called Greek sage. The species fruticosa can be difficult to grow generally because of watering but a variation called ‘Greek Skies’ in Australia is more tolerant. There seems to be a similar variation in some other countries. 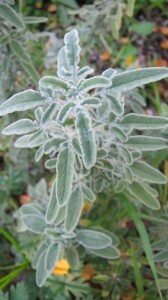 ‘Greek Skies’ foliage is very officinalis looking but it is a fairly permanent small shrub around a metre square. It flowers prolifically in spring and sets seed but to come true it is best to grow from cuttings. The species can be grown from seed. 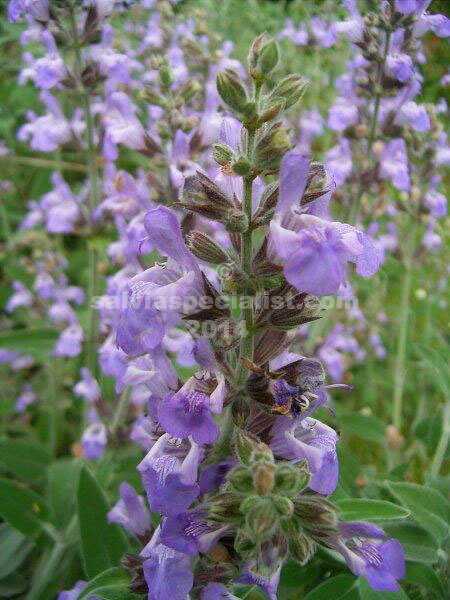 The species is known to have useful medical qualities which is a bit of a pest that the species can be difficult to grow so it is very difficult to obtain. The species has a pale pink flower but ‘Greek Skies’ has a mauve flower. The foliage is grey which accounts for its dislike of summer water. It also means the species is difficult to grow from cuttings. It is very frost tolerant. Fruticosa has a silly habit which starts to occur when it is a few years old – a section will die, no particular time of the year – not the whole plant. It could happen occasionally on other grey leaved plants. In flower mostly in October in Australia. Winter wet is deadly to grey plants, especially in pots where the extra water can’t get away, so by spring they can be looking fairly seedy. If you really want Greek Skies please enquire but I haven’t been growing it the last few years because it is a pest in the nursery about watering.